Two monster wildfires burned out of control on Saturday in northern and southern California, having already killed at least 11 people and forced hundreds of thousands to flee their homes. Trump early on Saturday tweeted that "gross mismanagement of forests" was to blame for the two unchecked wildfires. The remains of five of the victims in Northern California were discovered in or near burned out cars, three outside residences and one inside a home, Butte County's Honea said. Capt. Scott McLean of the California Department of Forestry and Fire Protection said the fire has grown to nearly 110 square miles (285 square kilometers) after destroying the town of Paradise. "There was really no firefight involved," McLean said, explaining that crews gave up on attacking the flames and instead helped people evacuate. "These firefighters were in the rescue mode all day yesterday." The entire town was ordered evacuated, setting off a desperate exodus in which many motorists got stuck in gridlocked traffic and abandoned their cars to flee foot. People in Paradise reported seeing much of the community go up in flames, including homes, supermarkets, businesses, restaurants, schools and a retirement center. McLean estimated that several thousand buildings were lost in Paradise, about 180 miles (290 kilometers) northeast of San Francisco. 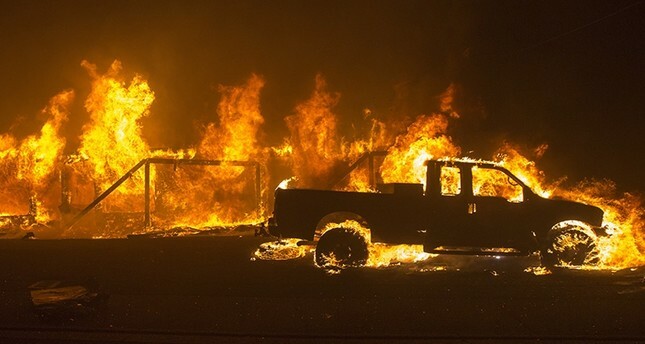 Wildfires also erupted in Southern California, with reports early Friday of two large fires scorching about 23 square miles (60 square kilometers) and threatening numerous communities. ABC7.com reported that 75,000 homes were under evacuation orders along the border of Ventura and Los Angeles counties. The fire in Paradise was reported shortly after daybreak Thursday. In the midst of the chaos, officials said they could not provide figures on the number of wounded, but County Cal Fire Chief Darren Read said that at least two firefighters and multiple residents were injured. Residents described fleeing their homes and getting stuck in traffic jams as the flames sparked explosions and toppled utility poles. "Things started exploding," resident Gina Oviedo said. "People started getting out of their vehicles and running." Many abandoned their cars and trucks on the side of the road. "They were abandoned because traffic was so bad, backed up for hours," Bass said. "It was absolutely dark," said resident Mike Molloy, who said he made a decision based on the wind to leave Thursday morning, packing only the minimum and joining a sea of other vehicles. "Most of them were immobile, with walkers or spouses that were bed-ridden, so we were trying to get additional units to come and try and help us, just taking as many as we could," he said. He described the community as having a lot of elderly residents, some with no vehicles. Kelly Lee called shelters looking for her husband's 93-year-old grandmother, Dorothy Herrera, who was last heard from Thursday morning. Herrera, who lives in Paradise with her 88-year-old husband, Lou, left a frantic voicemail at around 9:30 a.m. saying they needed to get out. A wildfire that tore through Malibu mansions and working-class suburban homes in Southern California's hills and canyons has killed two people and had more than doubled in size by Saturday. Officials took advantage of temporarily calm conditions to assess damage from the blaze that has burned 109 square miles (282 square kilometers) north and west of downtown Los Angeles. Firefighters were searching burned-out neighborhoods for new destruction from two blazes that have already destroyed 150 homes. Los Angeles County sheriff's Chief John Benedict said two people have been found dead but provided no details on the deaths. The fire erupted Thursday near the northwest corner of the city of Los Angeles as the region's notorious Santa Ana winds gusted, triggering overnight evacuations of an estimated 75,000 homes in western Los Angeles County and eastern Ventura County.